The Mount of Olives, one of three hills on a long ridge to the east of Jerusalem, is the location of many biblical events. Rising to more than 800 metres, it offers an unrivalled vista of the Old City and its environs. The hill, also called Mount Olivet, takes its name from the fact that it was once covered with olive trees. In the Old Testament, King David fled over the Mount of Olives to escape when his son Absalom rebelled (2 Samuel 15:30). After King Solomon turned away from God, he built pagan temples there for the gods of his foreign wives (1 Kings 11:7-8). Ezekiel had a vision of “the glory of the Lord” ascending from the city and stopping on the Mount of Olives (Ezekiel 11:23). Zechariah prophesied that in the final victory of the forces of good over the forces of evil, the Lord of hosts would “stand on the Mount of Olives” and the mount would be “split in two from east to west” (Zechariah 14:3-4). 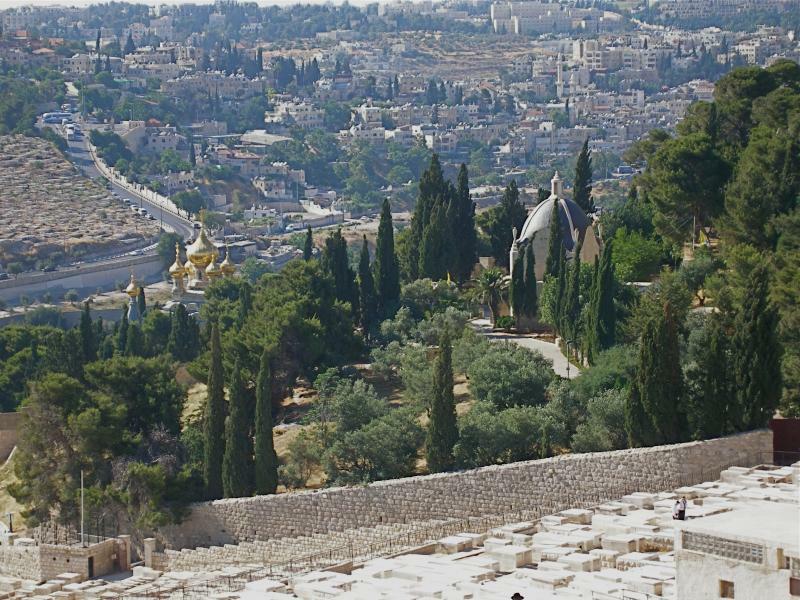 In the New Testament, Jesus often travelled over the Mount of Olives on the 40-minute walk from the Temple to Bethany. He also went there to pray or to rest. He went down the mount on his triumphal entry to Jerusalem on Palm Sunday, on the way weeping over the city’s future destruction (Luke 19:29-44). In a major address to his disciples on the mount, he foretold his Second Coming (Matthew 24:27-31). He prayed there with his disciples the night before he was arrested (Matthew 26:30-56). And he ascended into heaven from there (Acts 1:1-12). Until the destruction of the Temple, the Mount of Olives was a place where many Jews would sleep out, under the olive trees, during times of pilgrimage. During the Siege of Jerusalem which led to the destruction of the city in AD 70, Roman soldiers from the 10th Legion camped on the mount. In Jewish tradition, the Messiah will descend the Mount of Olives on Judgement Day and enter Jerusalem through the Golden Gate (the blocked-up double gate in the centre of the eastern wall of the Temple Mount, also known as the Gate of Mercy, or the Beautiful Gate). For this reason, Jews have always sought to be buried on the slopes of the mount. 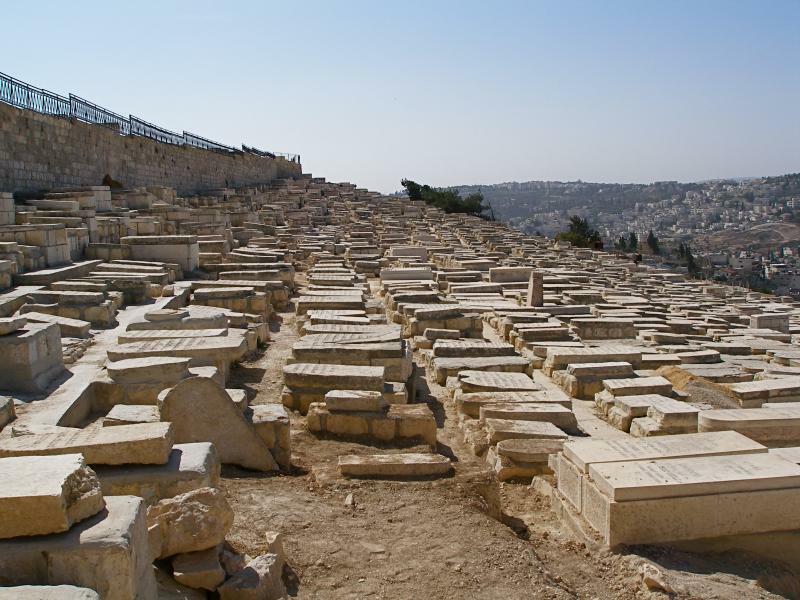 The area serves as one of Jerusalem’s main cemeteries, with an estimated 150,000 graves. Among them is a complex of catacombs called the Tombs of the Prophets. It is said to contain the graves of the prophets Haggai, Zechariah and Malachi, who lived in the 6th and 5th centuries BC, but the style of tombs belongs to a later time. From Byzantine times the mount became a place of church-building. By the 6th century it had 24 churches, surrounded by monasteries containing large numbers of monks and nuns. 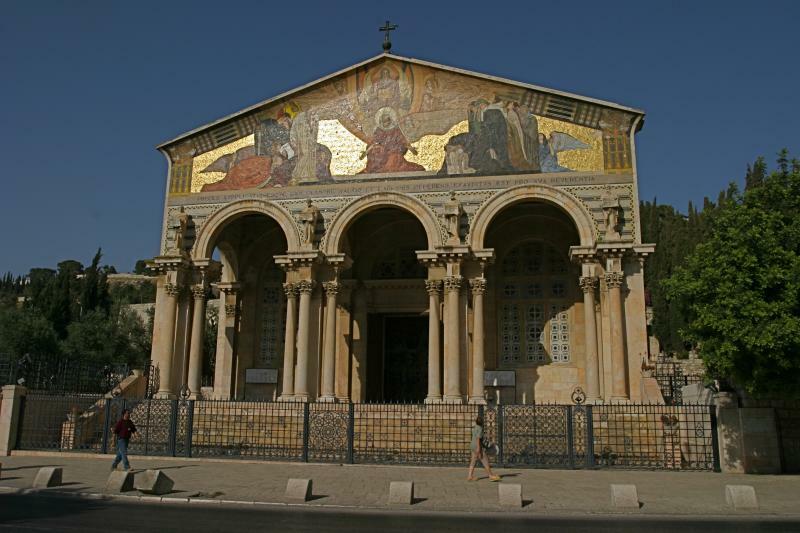 • Church of All Nations (Basilica of the Agony): A sombre church at Gethsemane, built over the rock on which Jesus is believed to have prayed in agony the night before he was crucified. • Church of St Mary Magdalene: A Russian Orthodox church whose seven gilded onion domes, each topped by a tall cross, make it one of Jerusalem’s most picturesque sights. • Church of Dominus Flevit: A church in the shape of a teardrop, commemorating the Gospel incident in which Jesus wept over the future fate of Jerusalem. • Church of Pater Noster: Recalling Christ’s teaching of the Lord’s Prayer, this church features translations of the prayer in 140 languages, inscribed on colourful ceramic plaques. • Dome of the Ascension: A small shrine, now a mosque marking the place where Jesus is believed to have ascended to heaven. • The garden and grotto of Gethsemane: The ancient olive grove identified as the place where Jesus went to pray the night before he was crucified, and the cave where his disciples are believed to have slept. • Tomb of Mary: A dimly-lit, below-ground church where a Christian tradition says the Mother of Jesus was buried.